Love to get spotted for your styling then peplum skirts, tops, and dresses can be the perfect pick for you. As peplum style is in the latest trend, the market is full of an array of design, sizes, and colors. This style looks pretty on both petite and plus-size ladies. If you love to flaunt your feminine looks and curves then peplum style is only for you. Flowers always work to refresh the mood and loved by ladies when embellished on their dresses. If you also madly in love with floral prints on tops then this trendy peplum blouse is for you. Enhance your style by pairing it with jeans for a casual yet pretty look. It features belted high-waist, V-neckline, and flared half sleeves. This article will make you look slim and tall. This turquoise color peplum tank top with its lace-up split back design will make you stand out from the crowd. It has floral trimmed lace bodice which is totally refreshing and adds alluring effect to your style. This tank top has round neck and is made up of rayon and spandex. This is perfect top to wear in summer. Love to flaunt your bare neckline, then go for this stylish off shoulder peplum blouse. Simply, pair it with jeans and you are ready to hit the party. 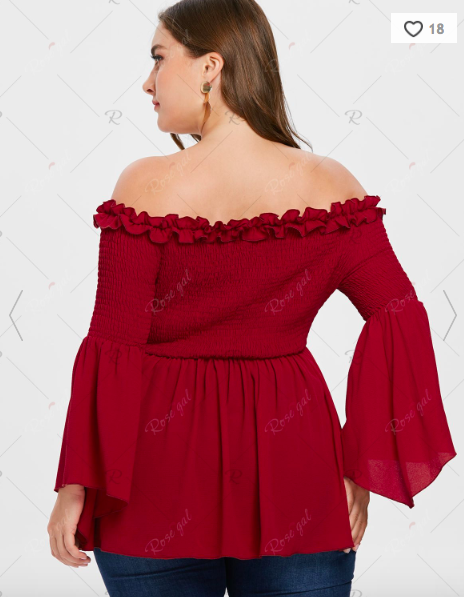 It features ruffle embellishment, solid red wine pattern, full sleeves with flare and an ideal pick for summer. Everyone wants to have the classy combination of a white top and blue denim in their summer collection. Match this white peplum top with blue jeans for an ultra-cool look. It is crafted from cotton blended fabric and has half button-up design on front. It also features hollow out details, peplum hemline with flares, V-neckline, and high-waisted design. This peplum top can give a lift to your dressing in both spring and summer. Add color to your closet with this red peplum blouse which makes you look feminine and adorable. This red lace blouse has long sleeves with bell shape design and peplum silhouette perfectly fits you and give you an elegant look. Pair it with blue or black color skinny jeans for a casual look. It is made up of polyester, has round neckline and fancy enough for any occasion.